“Think what a better world it would be if we all-the whole world-had cookies and milk about three o’clock every afternoon and then lay down with our blankies for a nap.” So said Robert Fulghum, author of All I Really Need to Know I Learned in Kindergarten. Amen! Right? And we want to make sure these cookies are full of wholesome and delicious ingredients. Bento boxes originated in ancient Japan, where wives would prepare rice balls (onigiri also called omusubi) and arrange them artfully in a box along with some fish and pickles. The luxury of the lunchbox would depend upon the budget of the housewife. (Some things never change.) You can bet the samurai were getting some high-quality fish while fieldworkers or farmers were lucky to get a sliver of any protein tucked into the rice. O-bento were also sent to school with boys. Originally made out of lacquered wood, over the centuries they have evolved and you can find bamboo, metal, plastic (and disposable) bento boxes. All these centuries of bento box-making have produced some magnificent works of art alongside cutesy lunches featuring popular Japanese anime characters. I’ve made standard bento lunches. 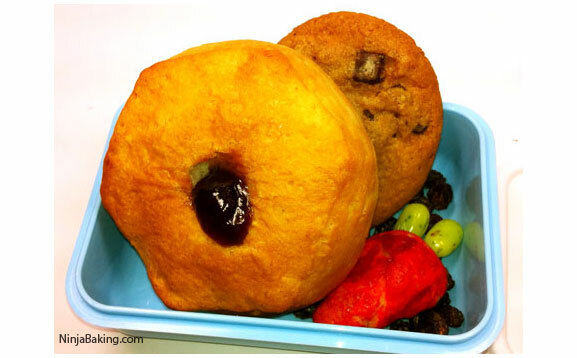 But I was inspired to think outside the box and create a cookie bento! 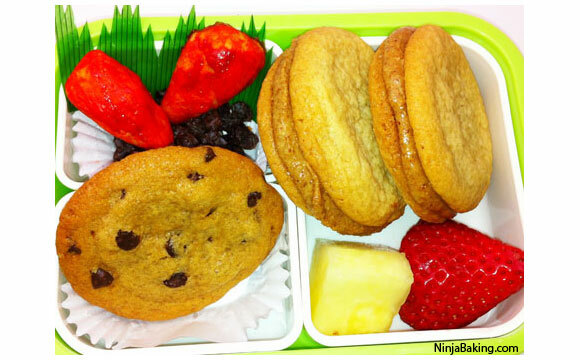 Here’s the how-to on the Ninja Baker’s Cookie Bento Box. Preheat an oven to 400 degrees. Unroll the piecrust onto lightly floured wax paper. With a clean paint brush, or chopstick, streak one side with orange gel food coloring. Smother coconut spread over the white surface. Sprinkle brown sugar and cinnamon over the spread. With a 1.5 inches round cookie cutter punch out circles. Roll and shape into mini carrots. Tuck a few small raisins on the top half to create the wider part of the carrot. With a clean paintbrush, smoothly paint on more orange food coloring. Place on parchment lined baking sheets. Bake for 6 to 8 minutes. Cool for a few minutes before eating or placing the cinnamony carrot cookies into a bed of raisins in the bento box. A classic PB with a sweet twist. Bake the sugar cookies per package directions. Smother the middles of cookies with almond (or peanut) butter. 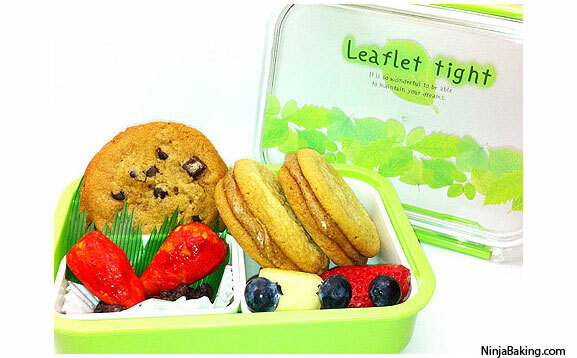 Sandwich together and place two into your bento lunch box. For “dessert,” nothing beats an old-fashioned chocolate chunk cookie. Bake the cookies per package instructions. Place them into your bento box. Until age 5, I only knew the Japanese language and food. Rice balls with pickles or fish in the centers were a standard lunchtime treat. (They’re called omusubi as well as onigiri.) So, I created an “onigiri” using Immaculate Buttermilk Biscuits. A standard in many Japanese lunch boxes. Bake the biscuits per package directions. With a melon baller or ¼ measuring spoon, scoop out a small bit of biscuit from the center. Fill the hole with jam. Place it into your bento lunch box. Of course, my bento boxes are only ideas to spark your imagination and creativity. So assemble all of the above as you like along with some lovely fresh fruit or whatever your healthy self desires. Wishing you sweet health and creative fun at lunchtime and always!